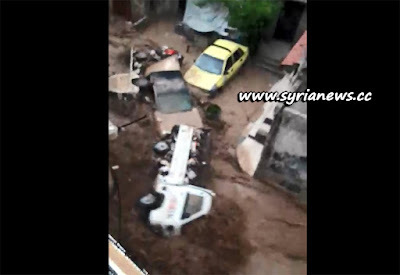 The Syrian capital Damascus received a sudden heavy rain that caused a flash flooding all over the city affecting the whole city and hitting more bad the Rukn Eddin mountain hill district. The sudden flash rain caused a massive flooding in the Syrian capital Damascus yesterday 26 April 2018 causing a number of injuries and material damage. The flooding was so intense it shored away cars and even people.